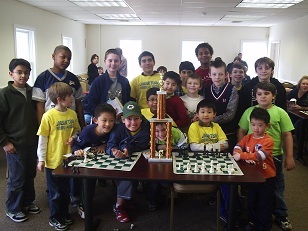 The CCFC’s Dream Team has posted some fantastic results in recent weeks, but we knew that our match with the Sparta (NJ) Chess Club would pose a serious challenge. Players from the Sparta CC have won many accolades in recent years, including several 2011 New Jersey state championships. But despite Sparta’s depth and experience, we were optimistic about our chances--and we were not disappointed. The Dream Teamers struck first, outscoring Sparta 13-7 in the opening round. Bolstered by this confidence, the Dream Teamers redoubled their efforts, scoring an incredible 14.5-5.5 in the second round! A truly outstanding performance. Next week’s matchup against a squad of high-school students might ordinarily make us nervous; but with wins like this at our back, it’s beginning to feel like there’s nothing the Dream Team can’t accomplish!